No matter how you take care of your gadgets, accidents happen. When they do, it can be frustrating to go without your device for hours or even days. It feels like you’re missing out on all the fun and news around you! Don’t just trust any repair shops for your precious iPad®. Choose a local iPad® repair in Virginia with highly-trained professionals. Call our Geeks today to save time AND money! Erratic or unresponsive iPad® screen? We can take care of it. Let’s get your iPad® 1 working like new today! Our expert Geeks are preferred for their quick yet affordable solutions to iPad® 2 screen problems. Did you break your iPad® 3 LCD? Don’t worry, our geeks can fix it and it’s on the safe hands. Get your iPad® 3 working again. Broken iPad® 4 Glass? We have geeks who can fix it and give a brand new look at an affordable price. Get your iPad® 4 working again. 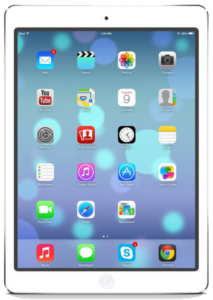 Is your iPad® mini screen not responding to you anymore? We have affordable and fast repairs when you get a quote today. Smashed screen on your dear iPad® Air? Why worry! Our skilled Geeks are just waiting – so schedule an appointment with them today! For other concerns with your iPad®, just call your local Geeks to receive a estimate – free of charge. Just dial our 24/7 number now! Haven’t found what you were looking for? Call us at our 24-hour support line at (804) 277-4080 OR visit our shop at 9045 W Broad St Henrico, VA.
One of the most common gadget problems is cracked screens. When you have your hands full (literally! ), it’s not surprising to accidentally drop your device. Worried because your warranty just expired? Talk to us: we have options for iPad® screen repair at reasonable prices. Our efficient process ensures you get your device as quickly as possible with little to no stress. Richmond Geeksis your local iPad® repair shop with a 24-hour support line. Our friendly yet professional technicians can get your gadget looking like new in just 30 MINUTES, depending on your issue and the availability of spare parts. Why wait for days when you get your iPad® immediately? Call now for a FREE estimate and to schedule your repair! We understand how busy you are, that’s why one of our goals is to provide you with quick yet accurate services so you can get back to your day. As a leading iPad® screen repair in VA, your time is important to us. When you come to us for repairs, feel free to also ask about proper maintenance of your device. We also offer superior warranty to ease your mind should your iPad® get into further scrapes in the future. Let our skilled technicians handle a complicated iPad® screen repair. Within minutes, you can continue to enjoy videos, music, and more through a clear screen. Call us NOW at (804) 277-4080 OR come to our shop from Mondays through Saturdays between 10am to 7pm, and Sundays from 11am to 7pm. Want to reach us online? Send us an email at admin richmondgeeks.com. Aside from fast iPad® screen repair, our Geeks also specialize in iPhones, iPods, and computers. Is your device showing signs of unresponsive buttons or does it need battery replacement? Our skilled technicians are here for you. Portable gadgets now play an essential role in our lives. More than a means for communication, we also use them to entertain ourselves and keep track of important files. This is why we aim to give the best iPad® screen repair service to residents of Virginia, as well as surrounding areas. Feel free to pay us a visit; our store is open 7 days a week. Why compromise on quality? Richmond Geeks is Virginia’s iPad® repair of choice for today’s mobile consumers.